The Integrity and Honesty Course is a Free Online Course you can begin right away. It is our service to you, free of charge. 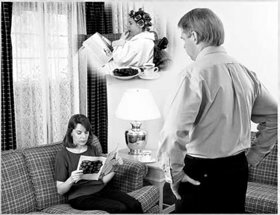 Scientology technology includes the factual explanation of departures, sudden and relatively unexplained, from jobs, families, locations and areas. These departures are called blow-offs. For instance, Man has been frantic about the high divorce rate, about the high job turnover in plants, about labor unrest and many other items all stemming from the same source—sudden departures or gradual departures. We have the view of a person who has a good job, who probably won’t get a better one, suddenly deciding to leave, and going. We have the view of a wife, with a perfectly good husband and family, up and leaving it all. We see a husband, with a pretty and attractive wife, breaking up the affinity and departing. Man explained this to himself by saying that things were done to him which he would not tolerate and therefore he had to leave. But if this were the explanation, all Man would have to do would be to make working conditions, marital relationships, jobs, training programs and so on all very excellent and the problem would be solved. But on the contrary, a close examination of working conditions and marital relationships demonstrates that improvement of conditions often worsens the amount of blow-off. Probably the finest working conditions in the world were achieved by Mr. Hershey (of chocolate bar fame) for his plant workers. Yet they revolted and even shot at him. This, in its turn, led to an industrial philosophy that the worse workers were treated, the more willing they were to stay—which in itself is as untrue as the better they are treated, the faster they blow-off. One can treat people so well that they grow ashamed of themselves (knowing they don’t deserve it) that a blow-off is precipitated. And certainly one can treat people so badly that they have no choice but to leave. But these are extreme conditions and in between these we have the majority of departures: The wife is doing her best to make a marriage and the husband wanders off on the trail of a promiscuous woman. The manager is trying to keep things going and the worker leaves. These, the unexplained, disrupt organizations and lives and it’s time we understood them. PEOPLE LEAVE BECAUSE OF THEIR OWN OVERTS AND WITHHOLDS. That is the factual fact and the hardbound rule. A man with a clean heart can’t be hurt. The man or woman who must-must-must become a victim and depart is departing because of his or her own overts and withholds. It doesn’t matter whether the person is departing from a town or a job. The cause is the same. ...which to him justifies a departure, a blow-off. People leave because of their own overts and withholds. Almost anyone, no matter his position, can remedy a situation, no matter what’s wrong, if he or she really wants to. 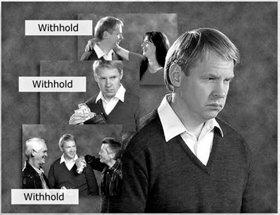 When the person no longer wants to remedy it, his own overt acts and withholds against the others involved in the situation have lowered his own ability to be responsible for it. Therefore he or she does not remedy the situation. Departure is the only apparent answer. To justify the departure, the person blowing off dreams up things done to him in an effort to minimize the overt by degrading those it was done to. The mechanics involved are quite simple. It is an irresponsibility on our part, now that we know this full mechanism, to permit this much irresponsibility. When a person threatens to leave a town, position, job or training program, the only kind thing to do is to get off that person’s overt acts and withholds. To do less sends the person off with the feeling of being degraded and having been harmed. It is amazing what trivial overts will cause a person to blow. One time a staff member was caught just before he blew and the original overt act against the organization was traced down to his failure to defend the organization when a criminal was speaking viciously about it. This failure to defend accumulated to itself more and more overts and withholds, such as failing to relay messages, failure to complete an assignment, until it finally utterly degraded the person into stealing something of no value. This theft caused the person to believe he had better leave. It is a rather noble commentary on Man that when a person finds himself, as he believes, incapable of restraining himself from injuring a benefactor, he will defend the benefactor by leaving. This is the real source of the blow-off. If we were to better a person’s working conditions in this light, we would see that we have simply magnified his overt acts and made it a certain fact that he would leave. If we punish, we can bring the value of the benefactor down a bit and thus lessen the value of the overt. But improvement and punishment are, neither one, answers. The answer lies in Scientology and using Scientology procedures to move the person up to a high-enough responsibility to take a job or a position and carry it out without all this weird hocus-pocus of “I’ve got to say you are doing things to me so I can leave and protect you from all the bad things I am doing to you.” That’s the way it is and it doesn’t make sense not to do something about it now that we know. Uneasy lies the head that has a bad conscience. Clean it up and you have a better person. the methods of application of an art or science as opposed to mere knowledge of the science or art itself. In Scientology, the term technology refers to the methods of application of Scientology principles to improve the functions of the mind and rehabilitate the potentials of the spirit, developed by L. Ron Hubbard. love, liking or any other emotional attitude; the degree of liking. The basic definition of affinity is the consideration of distance, whether good or bad. brought on quickly or abruptly. unyielding, rigid and inflexible, used in reference to rules, standards, customs, etc. unnecessarily mysterious or elaborate activity or talk to cover up a deception.